Introduction: There is increasing discrepancy between number of patients awaiting transplantation and the number of available organs. To increase the donor pool, live donor kidney transplantation is an excellent option and has become the gold standard for renal transplant. Most operations are performed with conventional laparoscopy with supra-pubic organ extraction from a Pfannenstiel incision. However, less invasive methods might encourage more prospective donors to come forward. Single incision donor nephrectomy has been described, but a larger access through the umbilicus might lead to a higher rate of incisional hernias and cosmetically poor deformation of the umbilicus postoperatively. We have developed a new approach for laparoscopic donor nephrectomy using a supra-pubic approach under visualization from the umbilicus. Methods: 6 patients (5 male, 1 female) underwent minimally invasive, supra-pubic donor nephrectomy of the left kidney. Patients were positioned in right lateral decubitus. In all patients, a 5 mm port was placed in the umbilicus and pneumoperitoneum obtained. After diagnostic laparoscopy, a 6 cm long incision was made in the supra-pubic region. A subcutaneous pocket was created and the fascia exposed 4 cm in the cephalad direction. Then, a 5 mm trocar and a 12 mm trocar were placed in the cephlad corners of the subcutaneous pocket, through the fascia, under direct visualization. The kidney was mobilized using laparoscopic retraction and ultrasonic dissection. The ureter was stapled. A 15 mm trocar was placed in the center of the supra-pubic incision to deploy a retrieval bag into the abdomen. The kidney was placed into the bag and renal artery and vein stapled. The supra-pubic port sites were joined to retrieve the kidney. The incision was closed in layers. Results: No intra- or postoperative complications were noted in our initial clinical series. One patient required an additional port for retraction. Estimated blood loss was less than 100 ml in all patients. OR times ranged from a median of 176 (range: 133 to 230) minutes. Median warm ischemia time was 7.5 (range: 5 to 17) minutes. All kidneys had excellent initial graft function after transplantation. 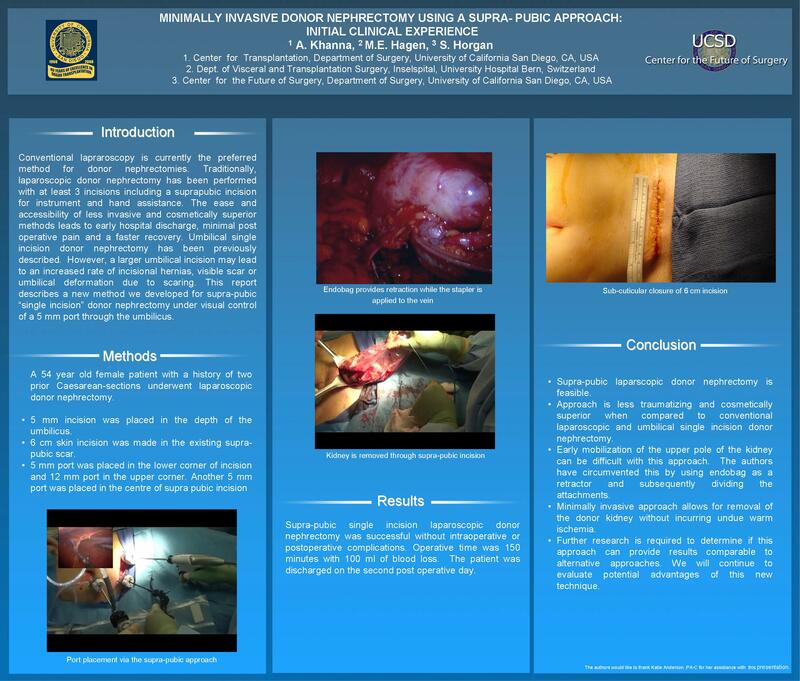 Conclusions: Supra-pubic laparoscopic donor nephrectomy appears feasible and might be less traumatizing and cosmetically superior when compared with conventional laparoscopic and umbilical single incision donor nephrectomy. However, early mobilization of the upper pole of the kidney is difficult with this approach. Further research will determine if this approach proves equality with safety when compared to alternative approaches and will also assess potential advantages of this new technique.